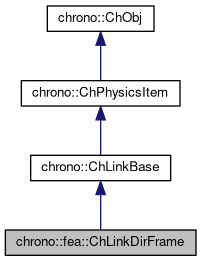 Class for creating a constraint between the direction of a FEA node of ChNodeFEAxyzD class, and a ChBodyFrame (frame). The D direction of the ChNodeFEAxyzD is enforced to stay parallel to a given direction associated to the ChBodyFrame. Get the reaction torque on the body, expressed in the link coordinate system. Get the connected xyzD node (point). Get the connected body (frame). Get the constrained direction, expressed in the reference coordinates of the body. Get the reaction torque on the node, expressed in the link coordinate system. Initialize this constraint, given the node and body frame to join. The constrained direction is the actual direction of the node (unless otherwise defined, using the optional 'dir' parameter). Note: the node and body must belong to the same ChSystem. Set the constrained direction, expressed in absolute coordinates. This function may be called only after initialization. Set the constrained direction, expressed in the reference coordinates of the body.